If you are the ones attributed with a best practice it can usually create a level of complacency, while you sit back and bask in the afterglow, or you rack your brains to extend this ‘leadership’ position in even better ways, determined not to relinquish this recognition and start to ‘mess’ with these practices. Often the result is you can lose sight of why you were a best practice as you upgrade to the next level of automation through technology, forgetting that part of the best practice might have been the personal touch and engagements you had with your customers, dealing individually with their specific problems, as you race to automate these, so you can keep ahead in practice. Firstly organizations need to move well beyond their lazy reliance on best practice comparison and they need to find better ways to explore emerging practices. But that takes many into the realm of increasing uncertainties, and most people and organizations are not trained for this exploration and experimentation, yet it is the place for gaining leading practice. It is just so easy to copy, yet how often do we fail to recognize all the contextual factors that went into making a specific set of (best) practices in one organization as those another organization simply believes it can blindly copy? 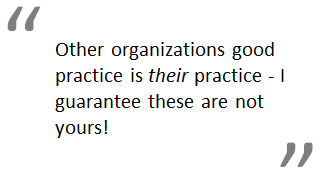 Other organizations good practice is their practice, in their circumstances and in adapting the practices to suit their market conditions and I guarantee these are not yours! Of course best practice has its comparative use to gather intelligence, to gain competitive understanding of where they are in their development. But these are their practices and to simply set about to adopt these as your way forward is just a huge, expensive mistake in many cases. I believe if you are focusing on the good and emerging practices within your own organization as the area to focus upon, to leverage and understand. Then to measure these with what your customer expects, your market is telling you or your ability to engineer real growth or not. Those become your practices for learning and wanting to improve into those that make your organization really work effectively in its context. Then applying, experimenting and learning from novel practices that provide growing confidence in creative thinking. Also give some thought for next practice, those practices that prompt reinvention. They start such totally fresh thinking; they challenge existing paradigms and move you towards considering new business models. One framework I strongly relate too is provided by www.cognitive-edge.com with their Cynefin framework. It places ‘practices’ in its appropriate domain. Simple, recently renamed the Obvious space, in which the relationship between cause and effect is obvious to all, the approach is to Sense – Categorise – Respond and we can apply best practice as it is more for incremental, the space where you are working with more of the ‘established’ routines, extracting the efficiencies and repeating established practice. Complex, this is the domain, in which the relationship between cause and effect can only be perceived in retrospect, but not in advance, the approach is to Probe – Sense – Respond and we can sense emergent practice. Chaotic, in which there is no relationship between cause and effect at systems level, the approach is to Act – Sense – Respond and we can discover novel practice. The fifth domain- The fifth domain is Disorder, which is the state of not knowing what type of causality exists, simply unaware of what you need to do and in which state you should apply. Often people will revert to their own comfort zone in making a decision adding more complexity to the disorder. In full use, the Cynefin framework has sub-domains, and the boundary between simple and chaotic is seen as a catastrophic one: complacency leads to failure and tumbles into chaos. For incremental innovation, constant reoccurring stuff, the ‘simple’ domain applies and best practice pushes down on efficiencies and effectiveness, on being consistent with standard processes and clear structures. Always be conscious of the limitations within best practice. For a more distinctive innovation you tend to move more towards the complicated domain, where experts ‘kick-in’ to help and offer plausible outcomes based on known experiences. You need to listen to conflicting advice and watch out for entrenched thinking so it can be challenged. If you are pushing for more radical innovation then it has a higher complexity and risk and falls into the complex domain. The range of options sometimes seems infinite where we explore more through the lens of perspectives and judgement. The outcomes are never easy to predict upfront and you need to keep looking for patterns to emerge and ‘inform’ your decisions. The use of experimentation, gamification, allowing greater interactions and a place you encourage dissent and finally be patient and allow time for reflection. This type of innovation can change the game. Then we have the chaotic domain, where disruptive innovation tends to sit. You lack any clear ‘cause and effect’ as it is entering more of the unknowns. The key is deciding to act, not from knowing the practice but recognizing it is novel, as you search for what will work, attempt to take back control and provide clear and direct interventions to firstly stabilize, understand and learn from and then further respond to bring it back into some order that allows you to participate. This framework offers a perspective that has enormous value as it offers managers a guide in placing different thoughts with different actions. The Cynefin framework offers a typology of contexts to help you sort out a variety of situations in which you might need to make different decisions and then provide what actions to take from the recognition. The framework looks to place the appropriate actions and decisions into the right context. The framework emerged from complexity theory and innovation falls into this. I would suggest focusing and developing your own practices is so much better that attempting to ‘adopt’ others best practices. When you next think of best practice as your answer, come back and reflect on this first, to place the appropriate innovation into the right practice that meets your needs, not someone else’s. Publishing note: This blog post was originally written on behalf of Hype and with their permission I have republished it on my own site. I recommend you should visit the Hype blog site where they have a range of contributors writing about a wide-ranging mix of ideas and thoughts around innovation, its well worth the visit. This entry was posted in Uncategorized and tagged changing the innovation game, Cynefin Model and Explaining Value, Cynefin Model and Type of Innovation, encouraging best practicies for innovation, Innovation Structure, making innovation practices distinct, making us innovation unique, pract, radical and disruptive innovation, rejecting best practices of others, surfacing hidden barriers to innovation. Bookmark the permalink. ← Redesigning the organizations middle for a new innovation shape. 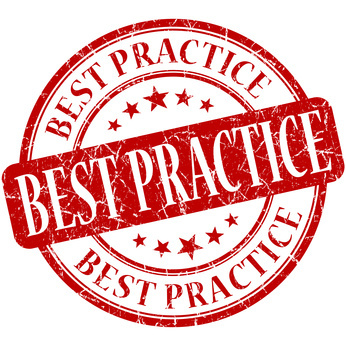 Agree: forget ‘best practices’ altogether. It is about YOUR practice as was stated very clearly in the PDMA’s Innovation Management Standard. There is no universal way of doing things, but there are relevant and fitting processes, methods, tools that suit your situation. The skill is, to be able to judge what is relevant and ignore the rest. There are universal truths however, which apply to everybody and any organization. Thanks for that post Paul. Most of us outside the innovation sphere would not even think to question the benefit of adopting best practices. They are by definition the “best.” Perhaps a better term would be “known practices” which, as you said, rest solidly in the “obvious” or “simple” quadrant of the Cynefin framework. At the Good Practice Exchange at the Wales Audit Office, we recognise that one size certainly does not fit all in the public sector. It’s why we encourage organisations to adapt and not adopt practices. In terms of your point about emerging practices and increasing uncertainties, doing nothing is not a safe option so we need to look at doing things differently. This post from Mark Jeffs is a good one (http://jointhedwts.wordpress.com/2014/03/08/do-nothing-is-not-the-safe-option/), and the Auditor General for Wales has also advocated well-managed risk taking (https://vimeo.com/album/2564627/video/76701938). All in all, your blogpost looks at a few issues that we need to look at in Wales – very timely. 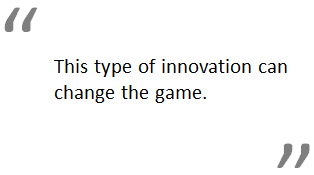 I’ve heard Wales is looking at a number of changes in its innovation practice. I’m sure that is going to be positive to deliver public service better. I undertook some work for Singapore Public Service some years back to understand how each part of PS was undertaking innovation. Thankfully they did not ‘prescribe’ and ‘force’ changes on each part as it was evolving different services to meet different demands that make up services within the public sector. Some sharing of practices, some looking outside and evaluating differences but I was surprised at how the end result was kept very open. No central dictates on following a given process but clearly the validation of how each department, body or authority evolved had exchanges centrally but I was pleased with many that innovation evolution was determined more by what services were needed to be delivered and that drove allocation of resources but still permitted individual experimentation through learning. Best wishes on your initiatives. I can relate to the idea of organisations ‘craving best practice’ like an addiction to a drug. In large part I think much of this craving is down to a lack of understanding and a desire to be seen to be doing ‘something’ is more important that actually achieving anything useful. In some respects I think ‘best practice’ has become an over used, and discredited phrase, worn out by people who don’t really understand what they mean when they say it. Your post is helpful in explaining the difference between the different types of practice. 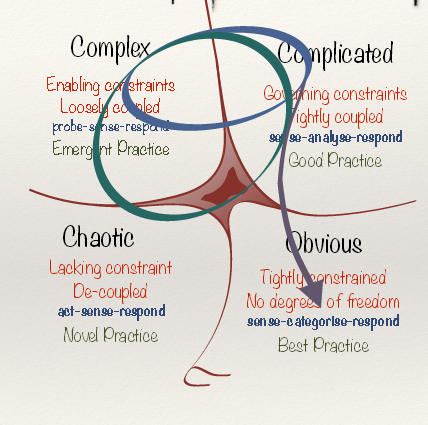 I do like the Cynefin framework and have been working with it for a while. One final comment on best practice, I did see a Dilbert cartoon recently which said something along the lines of, ‘if everyone is doing best practice, doesn’t that make it mediocre?’. A fair point! I will see if I can dig it out and tweet it to you. On a more serious note, it does worry me when best practice gets mandated by people who don’t recognise the difference between simple (obvious), complicated and complex situations. It drove me to write a post about Groundhog Day and the Tyranny of Best Practice earlier this year. It stirred up a few comments, but I think it was worth the effort. Good to read your post, looking forward to more. Also good to see you in conversation with my colleague Dyfrig.